West Windsor, N.J. – Mercer County Community College (MCCC) was named as home of one of the top college radio stations in the U.S. for the second straight year by BestColleges.com, a national website that serves as a resource for prospective college students. WWFM The Classical Network, located on MCCC’s West Windsor Campus, was included in the list of “51 Colleges with the Best Radio Stations” among other high-profile colleges, including Georgetown, University of California-Berkeley, DePaul University, and Florida State University. WWFM was one of only two community college-based radio stations in the survey, the only full-time classical music station, and one of only three in New Jersey – the others being radio stations at Rutgers and Stevens Institute of Technology. 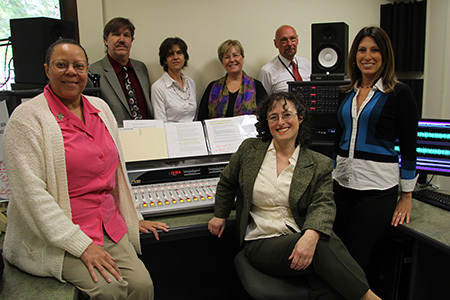 In the studio with WWFM staff members, front row from left, Winifred Howard, Rachel Katz and Marcia Galambos; back row from left, David Osengerg, Diane Guvenis, Alice Weiss and General Manager Peter Fretwell. BestColleges.com also noted that WWFM broadcasts from MCCC to both the local communities in New Jersey and Pennsylvania, as well as Philadelphia and New York via digital radio and through webcasts. Peter Fretwell, general manager at WWFM, said the staff was proud to have achieved this recognition for a second consecutive year. The full list of selected college stations is available here. Located on MCCC’s West Windsor Campus, WWFM is New Jersey’s only 24-hour classical music station. The station can be heard at 89.1 FM throughout Central New Jersey, in Philadelphia on 89.5 HD2, in New York on 89.9 HD2, and worldwide via www.wwfm.org.